The Nuclear Regulatory Commission is rushing a court-ordered evaluation of the risks of storing spent nuclear fuel at the country's nuclear plants, according to two dozen watchdog groups. In detailed public comments solicited by the NRC, the groups together contend that the agency's two-year timeline for an environmental impact statement on the spent-fuel risks is inadequate. The NRC "would be well-advised to slow it down, quite apart from anybody's position on nuclear power. ... They just don't have the data," said Arjun Makhijani, an electrical and nuclear engineer who is president of the Institute for Energy and Environmental Research. He submitted an expert declaration accompanying the comments from the watchdog groups. Long-term spent-fuel storage at the nuclear plant sites is now a virtual certainty because there is no federal project for a national repository. Plans for such a facility at Yucca Mountain in Nevada were withdrawn by the Obama administration in 2010. Meanwhile, waste-storage pools at many plants are already filled far beyond their original design capacity, and plant operators have been reluctant to convert to more expensive dry cask storage. Some pools are leaking radioactive water, and a spent-fuel pool fire could be catastrophic, releasing large amounts of radiation. Many scientists have sounded the alarm about the possibility of an accident or terrorist strike involving the spent-fuel pools. According to 2010 statistics gathered by the Department of Energy, San Onofre Nuclear Generating Station in the northwestern corner of San Diego County, operated by Southern California Edison, has more than 1,000 metric tons of spent fuel stored in pools on site, and another 360 tons in dry cask storage. 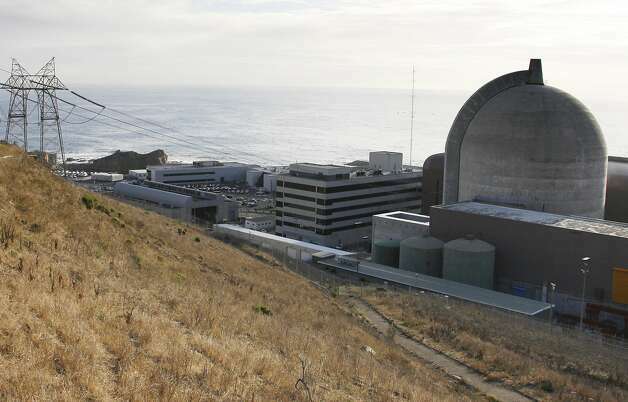 At Diablo Canyon near Avila Beach (San Luis Obispo County), operated by Pacific Gas and Electric Co., about 880 tons of spent fuel were in wet storage and another 220 tons in dry storage. The comprehensive risk assessment the groups seek would almost certainly be a powerful weapon in the fight against licensing new plants and relicensing existing plants in the country's aging nuclear fleet. But that will take more time, and for some of the watchdogs, that time is a double-edged sword. All reactor licensing and relicensing decisions are on hold during the NRC's process, meaning that if the review were to take seven to 10 years, as the groups suggest it might, it could amount to a de facto license renewal for that period. Environmental lawyer Diane Curran, one of the principal attorneys for the watchdog groups, admits that a delay benefiting plant operators short-term "is one outcome," but stresses that a thorough environmental evaluation of the spent-fuel storage risks could be a game-changer across the country in licensing cases. "Ultimately the agency is going to have to make a decision about whether to renew those existing licenses," Curran said. "And to some degree it's an aggregate decision. Do we want to keep generating spent fuel which carries these costs and risks, for which we have no solution?" According to its website, the NRC currently has pending applications for 30 new reactors at 19 sites, and Curran pointed out that licensing decisions for those new reactors will also be on hold during the assessment process. "It's very clear for those reactors that nothing is going to happen" until the environmental impact statement on spent-fuel storage is in place, she said. Makhijani said that for the NRC to satisfy the court, "it will take well over a decade of work. ... If they keep this schedule the EIS will be speculative and will be shown to be speculative, and they'll wind up back in court." NRC spokesman David McIntyre disputed that assertion. "We are confident we can do a comprehensive report within the two years the commission has given us that will satisfy the court's remand," he said. San Onofre's unit 1 was shut down permanently in 1992 and has been dismantled. Units 2 and 3 are licensed until 2022, but they have been shut down since early 2012 after premature wear was discovered in steam generator tubes. It is unclear when or whether either unit will reopen. Diablo Canyon's units 1 and 2 are licensed through 2024 and 2025, respectively.